Sometimes tragedy strikes so close that it changes the trajectory of a life. For NC State student Rejaul Hasan, 2013 had been a good year. After studying textiles at University of Manchester in England, he was back home in Bangladesh working for a global sports apparel company. He traveled extensively to local factories to source apparel. But on April 24 that year, the global apparel industry shook. Just a few miles from the capital of Bangladesh, the eight-story Rana Plaza factory collapsed, killing more than 1,100 workers and injuring thousands more. It remains the deadliest garment factory accident in history. The global reputation of Poole College of Management and the College of Textiles drew Hasan to NC State, where he began Ph.D. study in College of Textiles in 2015. 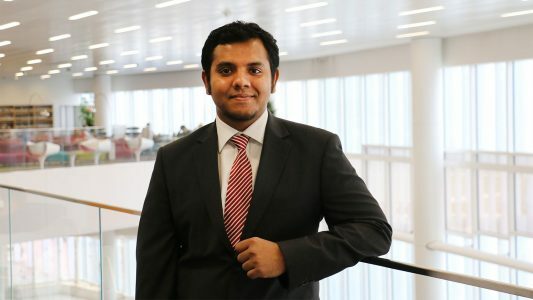 With a focus on sustainability and supply chain, his dissertation research aims to uncover the price point at which garments made in Bangladesh must be purchased to ensure sustainability, safety and fair labor rights for factory workers. As one of the world’s leading garment exporters, Bangladesh offers low manufacturing prices to apparel brands. “According to local manufacturers, the price is too low. When they are underpaid, they cannot ensure better safety or sustainability,” Hasan said. His research will take him back to Bangladesh, where he will use his existing professional network to compile data from locally-owned factories and subcontractors. A recipient of NC State’s Wilkinson Graduate Ethics Fellowship, Hasan has involved Cotton Inc., Poole College’s Supply Chain Resource Cooperative and faculty from College of Textiles and Pennsylvania State University in this project. His research could ultimately become a framework that helps determine responsible garment sourcing prices in other countries. “If I can help save one person dying from a factory fire, that’s a meaningful mission. I hope my study will help Bangladesh build a safer apparel supply chain. I’m doing something meaningful to help my country and create a better life,” he said. In addition to his studies, Hasan has served as a Student Associate in Poole College’s Business Sustainability Collaborative. By helping educate students about sustainability, he hopes more consumers will demand sustainability from brands. “When you’re going to buy something, try to learn how it’s made. When consumers do that, brands and retailers will do better sourcing to ensure a safe, sustainable and fair supply chain,” Hasan said. After graduating from NC State, Hasan hopes to work for a major apparel brand or return to Bangladesh, where he has already started a company to support sustainable practices among apparel brands, retailers and local manufacturers.